Somewhere inside Porsche must be a secret directive to race everything they make. Someone has to race the Porsche—or else it is no Porsche. We’ve seen everything from rally Cayennes to Panamera touring cars, and now, at last, I got to watch Porsche tractors race on Laguna Seca. Yes, tractors. I even got to drive one after the race to see how it worked! My life is now complete. Laguna Seca is one of America’s most legendary race tracks, yet its infamous sand-bordered tarmac is also one of the last places you’d expect to see a tractor. However, because Rennsport Reunion VI is a Porsche racing event, and Porsche’s founder designed a tractor branded with the Porsche name right there on the side, we got a tractor race. It had to happen! And it ruled. Rennsport Reunion is the once-every-few-years gathering of Porsche’s most significant race cars, along with a whole lot of other mad cars from owners, tuning companies and even Porsche themselves. Per Porsche’s own numbers, 81,550 Porsche obsessives descended upon Laguna Seca last weekend. It was the biggest crowd they’ve ever had. Everything from Formula One engines stuffed into 930 shells to the first RWB 911 I’ve ever liked and off-road 911s galore were on display. Rennsport Reunion in a nutshell: Here’s a Pink Pig-liveried race-tractor lurking behind the 919 Hybrid Evo. The Porsches at Rennsport aren’t just parked on display. They move. They make noise. They are here to share the entire Porsche experience with the world, whatever it may be. Sometimes they belch smoke, or lose a wheel in spectacular fashion. Hey, that’s racing. Thing is, I’d been asking for years to drive a Porsche tractor, as it’s been one of those great curiosities I’ve had about one of Ferdinand Porsche’s most overlooked creations. Finally, it was in this atmosphere of sit, touch, hear, watch and enjoy my car that I got to drive one. Now I think my problem is that I need one, and I’m pretty sure it would take up a good quarter of my backyard on its own. Porsche tractors in their usual red and yellow paint scheme lined up on the grid for the first race. If you love seeing a Porsche get used for its intended purpose, you have to appreciate the lovely Porsche tractor. It’s a pretty, streamlined design, and most are bright red. You’re farming in style on one of these bad boys, my friend. Porsche tractors have a fairly straightforward shifter in the middle. The Standard even had five forward speeds plus a reverse gear. Perhaps it’s the relative obscurity of this lawn-mowing, hay-baling Porsche among all the Porsche fans who declare their undying love of 356s or 935s. We tend to forget that automakers designed other stuff, too. Or maybe it’s the fact that I learned how to drive on a lawnmower, and also used to exchange infield tractor duty for track time at my local race track when I was super broke. Either way, the Porsche tractor is always my favorite sight whenever one miraculously shows up at a big Porsche event. It’s such a weirdo! I love it so much. The namesake and founder of Porsche itself, Ferdinand Porsche, worked on a “people’s tractor” (sound familiar?) design at the request of the German government, according to the Porsche-Diesel North American Registry. However, much like the Volkswagen Beetle, the Volksschlepper never went into production for people to actually buy because of World War II. After the war, only companies that had produced tractors before and during the war were allowed to make them, That left Porsche out, so Porsche’s tractor design and name were licensed out to companies like Allgaier, Mannesmann and Hofherr Schrantz to produce starting in the fifties. The Pink Pig was one of the Allgaier tractors. The Master was the largest tractor in the race, and it even had a second seat behind the driver. One-, two-, three-, and four-cylinder Porsche tractors were sold, deemed the Junior, Standard, Super and Master, respectively. At Rennsport Reunion, they all raced together in one group, although some also claimed “class” winner titles because, well, why not? While around 125,000 Porsche tractors were sold worldwide and some are even still in use on farms like it’s no big deal, it’s still a bit of a rarity to see one in the United States. Collectors are bringing more of them over now, but when they were new, the larger Porsche tractors were pricey compared to other tractors sold in the U.S., so they didn’t sell as well. Thus, it’s a joy to see even one Porsche tractor in the wild, much less an entire herd racing each other. Perhaps the best thing about the Porsche tractor race was that the rules were left completely open to whatever the racers wanted to do. While none of the participants who I spoke with would fess up to any trick engine modifications, several incorporated wings and other fun things, like racing liveries and even trailers towed behind the tractor. Hey, if you can tow, use it! While Rennsport meant this to be a for-fun exhibition more than a race, I’d say that this is truly racing in its purest form: Just a person and what they can do with their big clattery diesel Porsche tractor. Besides, racing should be fun. Otherwise, you’re doing it wrong. When you have a GT1 wing sitting around that’s worth three times what you paid for the tractor, why not add an active aero system to the tractor? Of all the customized tractors, Team Gunnar’s Pink Pig-liveried 1957 Standard tractor definitely stole the show. John Oates—as in, Oates of Hall & Oates fame—even drove it on Saturday’s race, decked out in matching pink overalls. It featured front and rear wings from a 962 (in street course guise) and a Porsche 911 GT1, respectively, and had graphics of both of Porsche’s first- and second-place 911 RSRs from Le Mans this year on top. It even had active aerodynamics, as the driver could drop the rear wing on the straights using the power take-off lever that’s usually used for farm implements. Gotta take the kids along! A trailer behind the Pink Pig tractor hauled a small herd of toy tractors painted up as Mini-Pigs to match. Even the team’s pit support cart was dressed up to match the Pink Pig. Team Gunnar’s pit support cart, dressed up for Pig-mania. “We didn’t have time to make the shirt that said ‘Eat More Chicken,’ because we want you to eat chicken this weekend, and not pigs,” he continued. The pigs are their friends. 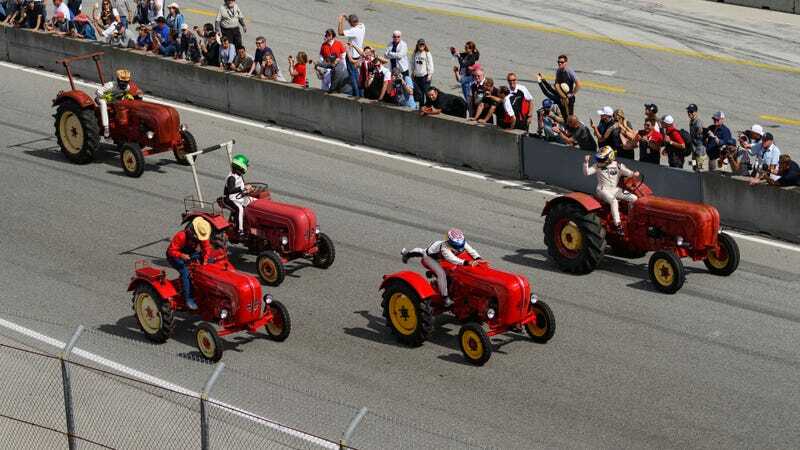 The tractor race set off with a traditional Le Mans start. Drivers ran to their tractors to start the race, some still in racing suits from the rest of the day’s activities, and a few even in overalls. Some drivers attached cowboy hats on top of their helmets. Patrick Long looks back after taking an early lead at the start of the first race. That’s when the tractor race became pure, delightful chaos as drivers tried to be the first one out, and make their way around the tractors in front of them. There was no qualifying or real order to the line-up, so less powerful tractors were mixed in among the others. Of course someone added Martini stripes! I’m digging the cowboy hat and ex-Le Mans suit look. Although a couple tractors were significantly slower than the others—such that we were all cheering for the very last tractor just to finish after everyone had left him behind—the pointy end of the field was closely matched! I saw four-wide racing over the crest on the pit straight! When’s the last time you saw that outside of big oval races? The fact that this race had few if any established rules also allowed an extra element of strategy: Some tractors opted to take shortcuts off the pavement to get ahead. Maybe that wasn’t the best for the next run group right after the tractor race to have dirt strewn across the pavement, but it was hilarious to watch. Racers also squat down or hung a leg down the back of their tractors in an attempt to become more aerodynamic, or sometimes shook their fist at their on-track nemesis for effect. This may have been done strictly for fun, but it was surprisingly cutthroat! 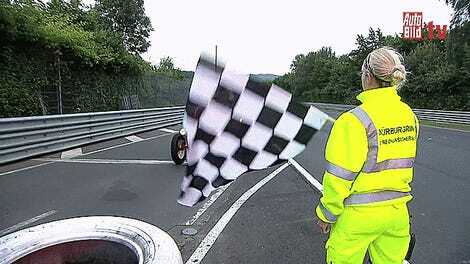 Track limits? What are those? The tractor race only went through Turn 5 at Laguna Seca as it would have taken too long for the tractors to race a lap of the full course. Laguna Seca’s most beloved feature—the Corkscrew—is also extremely steep, and that might’ve been a problem. “Can you imagine 20 tractors going down the Corkscrew?” asked Jeanette. “There’d be five deaths before they got to the second turn of the Corkscrew,” he joked. We saw tractors four-wide heading into the hairpin during the second race! The straggler in the first race seemed to revel in his position back there. Of course, I had to know if these things were any fun to actually drive. Were the tractors just delightful, like my 944, or more terrifying, like the first 917s? After mentioning to Porsche factory driver Patrick Long that “drive a Porsche tractor” was on my bucket list, he offered up a brief drive of his Porsche Junior. I was surprised that he’d offer that so readily, but this was Rennsport, and we are talking about the same driver who started Lüftgekühlt to bring together all manner of aircooled fans in one place. If there ever was a polar opposite to the cordoned-off, no-touching world of snooty concours events, Rennsport is it. The Long family brought two tractors for the weekend. Patrick Long, on the Porsche Junior. The lightweight Junior proved itself to be somewhat of a dark horse in the tractor races. It only had 14 horsepower, but it was the smallest and the lightest tractor of the race. Long’s finished third overall in the first race. Of course, Long noted that he learned how to drive a manual transmission on a different tractor at a family ranch at age 12. His dad even raced with him on Saturday’s tractor race. Clearly, the field of tractor racers had more experience than I thought. Long’s Junior was a thing of beauty, as he’d purchased it from a German farmer who’d been using it for all these years, and it was still decorated with all the patina and grime of use. Like most of the tractors there, it was just brought into running condition. It even still had its old, cracked tires from when it was bought. Starting the tractor takes a bit of time, which is why many were left idling for the Le Mans start. First, you have to pull the glow plug on the dashboard, which heats up the air-fuel mixture enough for a cold start. Then as its big 822cc single cylinder slowly clang-clang-clang-clang-clangs to life, you set the idle speed using a hand throttle behind the steering wheel. That’s it, man. I need one now. Aside from that, it was fairly straightforward. The clutch is on the right, and a brake pedal (split in two to brake one side individually if needed) was on the left, with a shiny silver button for a throttle underneath. A three-speed gearbox (plus one reverse gear) was controlled by the lever between your legs. There’s even a power take-off feature where you attach various farm implements to be powered by the tractor as they’re towed along. Perhaps the biggest surprise is how easy these are to turn. Sure, all the weight of the engine is up front, but the small, narrow tires willingly carved all the little donuts I wanted to do with them. You can apply the brakes on only one side for even tighter turns if you wish, but that wouldn’t be necessary for the relatively wide-open track of Laguna Seca. The tires are ancient, but it didn’t matter. This was the Junior to beat. Gobs of torque—the best feature of any racing vehicle, if you ask me—allowed the Junior to set off easily in whichever of the three gears you wanted. While the shifter wasn’t especially precise, the fact that you can set off in high gear makes racing these a matter of popping it in third and leaving your foot on the button-shaped throttle as much as possible. Clutching in brought the tractor to a halt, so that was the last thing you wanted to do during the race. Turning it off is rather simple. You simply lift the hand throttle up until the big single cylinder ceases to clang, and disconnect the battery afterwards as these tractors are notorious for draining those while parked. Most importantly, it’s impossible to sit on top of a Porsche tractor used for racing and not feel joy. This is exactly the kind of whimsy that big, serious racing weekends could use more of. Racing should be fun. Even the drivers there to give the 919 Hybrid Evo its last runs on a race track got in on the tractor action. That being said, talking my way into a brief tractor drive was a little dangerous. Not only does it mean that I now want a Porsche tractor as this tractor race was one of the few pure, clangy, universally appreciated joys I’ve encountered in life, but I’m now emboldened to pursue some of the harder items on my bucket list. As in, how can I go to space? Thanks! Anyway, if anyone needs a tractor driver for Rennsport Reunion VII, let me know! I learned how to drive on a John Deere lawnmower. Vital repairs at the Long family’s campsite: the bigger tractor needs a badge! Junior (left) vs. Super (right) vs. squat (middle). The Pink Pig wasn’t the only tractor with a big wing. Here’s where you add farm implements onto the tractor in the rear. One tractor even had its original speed sign on the front. Long peaces out from the rest of the field at the start of the first race. Piglets at rest in the paddock. All suited up with important places to go, of course. Time to work on my running skills, I guess. Least impressive under-the-bridge speed trap time ever. Or most, depending on your perspective.